Isfahan is known as a city with numerous beautiful gardens, historical bridges, and palaces. Most of these monuments have a history for at least for a hundred years. Among all of these gardens, the one which is more popular is Chehel Sotoun Palace, a Persian Garden with magnificent mural paintings. This garden has been listed as one of nine Persian Gardens in UNESCO World Heritage Site in 2011. There are also magnificent mural paintings in the main hall, each with a historical story. Here, we are going to talk about the history, garden, and story behind each mural painting at the place. Chehel Sotoun Palace which literally means “Forty Columns” in Farsi is actually a complex with a long pool and a pavilion in the middle of the huge garden. Some people say that the name was inspired by the twenty slender wooden columns which reflected in the waters of the pool and become be forty as a whole. However, it is not true as there is no reflection as the pool at all. The other story on the name is because in Zoroastrian believes the number forty is a holy number and indicates a large number. The garden covers an area of 60,000 square meters, and the area of the palace is about 2125 square meters. The same as every Persian Garden, after the entrance there is a pool in the middle of the garden, which is usually in front of the palace. The magnificent terrace is the dominant feature of the palace, each column, and ceiling built from woods of Platanus orientalis tree. The interior design is magnificent with beautiful mirrored glass. On northeastern and southeastern of the palace there are two beautiful semi large rooms which are beautifully ornamented with plasters works and paintings. Unfortunately, these rooms have been seriously damaged. The northern, and western Eivans are decorated with portraits of European ambassadors and famous members of European delegations. There are numbers of rooms in the southeastern part of the Palace with a masterpiece of art and a stained glass window. There is a glorious portal at the southern wall which was transferred from Qotbieh Mosque to the Palace. There are four statues of human and lion at four corners of the large pool in the front of the palace, these statues were not built at the place, but brought to the Palace from another palace called “Ghasre Sarpush Khaneh”. The first part of Chehel Sotoun Palace was built during Shah Abbas Safavid about four hundred years ago. 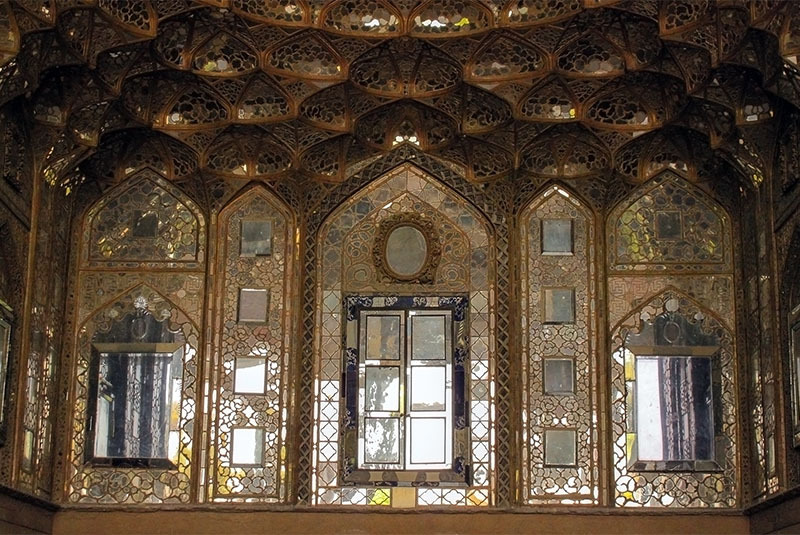 Later, during Shah Abbas, the second the beautiful frontal porch and the mirror ornamented Eivan added to the monument. 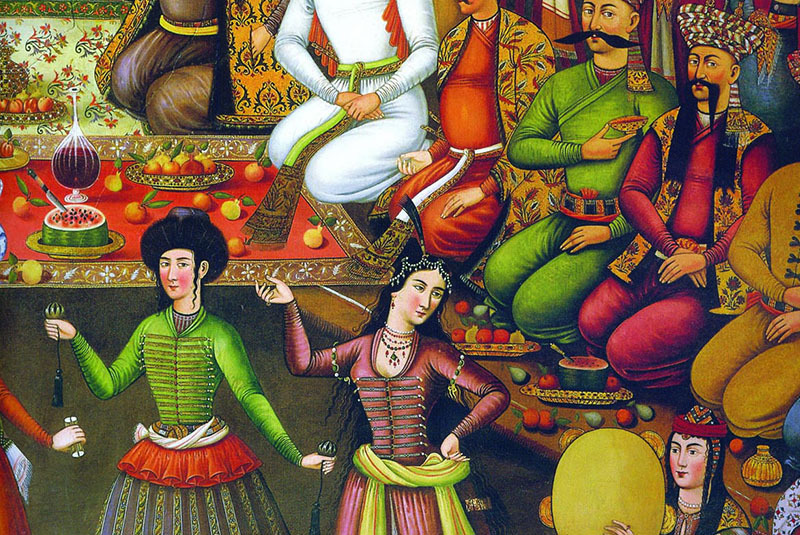 Initially, the place used as a reception palace so the kings hosted foreign delegations and royal guests, Shah Abbas II, and his successors would receive dignitaries and ambassadors, either on the terrace or in one of the stately reception halls at the palace. Finally, the palace was completed in 1647. There are some pre- Islamic architecture's specification, for instance, the same as Persepolis, the palace stands on a platform higher than the ground floor. The ceiling of the porch is decorated with beautiful inlaid works which are known as one of the best among Iranian palaces. At the center of the porch, there is a small marble pool with the status of a lion at each corner of the rectangular shaped pool. It is believed that the lion protects the building from any harm. There used to be a holy Qoran above the entrance door to the reception hall, which is said to be stamped by the Third Imam of Shiites; Imam Hossein, and is kept in the palace’s museum at the moment. There are numbers of interesting pictures of European figures, presumably based on the ambassadors and their retinue who would have stayed in the palace from time to time at the outside of the building. There are mural paintings at every wall of the main hall, each with a history, for instance, The Battle of Chalderan against the Ottoman Sultan Selim II which was fought without firearms in 1514, Reception for the Mughal Emperor Humayun who sought refuge in Persia in 1544, a royal banquet in honor of Emir of Bukhara in 1611, and Nader Sha's triumph against the Indian Army at Karnal in 1739.